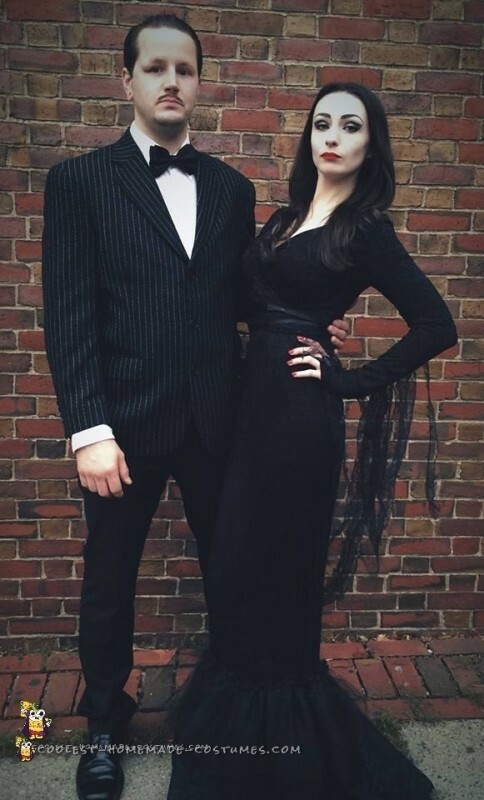 This Morticia and Gomez Addams couple costume started off as a couple and grew the day before Halloween into a fantastic group costume. We had a wonderful time walking through Salem MA showing off our hard work. We barley made it a few feet t a time before being asked to take a photo. We were honored so many people appreciated our costumes and efforts. I was Morticia and the costume making was a bit involved. I started with a black tunic maxi dress from forever21 then layered a lace maxi dress from eBay over it. step two it where it got tricky. I am a stickler for perfection and took months to find the right material for the “bustle” on the bottom. Several yards of Black tulle gathered and tacked onto the bottom on the maxi dress. The gloves/sleeve I sewed by hand with the same tulle from the bustle and added strips to hang down and give the ever famous ethereal Morticia look. Makeup was the most fun, white liquid face makeup mixed with the palest foundation I could find and brush cheeks with gray eye shadow. Gomez was mush easier. We found his suit coat at the FIRST second hand shop we looked in. Pants, shoes, and bowtie were already owned so Gomez just needed to grow out his infamous “stach” and that was it! 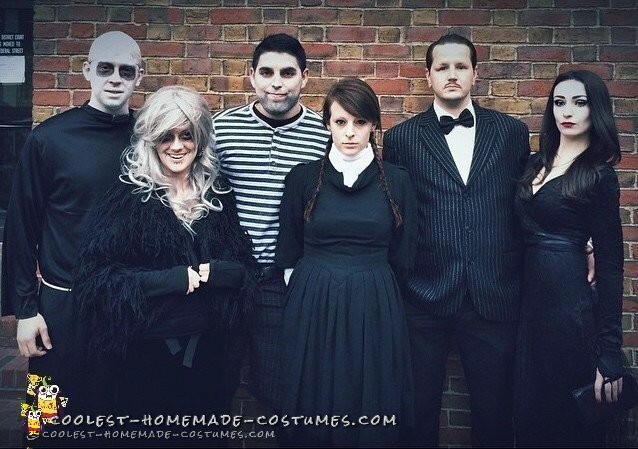 After the Morticia and Gomez Addams couple costume, the rest of the clan: Grandma, Fester, Wednesday, and Pugsley were also pretty easy and were pulled together in a day.